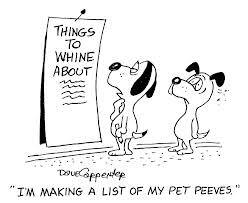 A pet peeve is a minor annoyance that an individual identifies as particularly annoying, to a greater degree than others may find it. For example, a supervisor may have a pet peeve about people leaving the lid on the copier up and react angrily, be annoyed when others interrupt when speaking, or by messy desks of their subordinates. That same supervisor may witness employees coming into work late, and not feel any annoyance whatsoever. Oh, there are some legitimate gripes that really don’t qualify under the definition of “pet peeve” because the act is more an inconsiderate act, such as leaving hair on bar soap. The term is a back-formation from the 14th-century word peevish, meaning “ornery or ill-tempered”. So, in other words, people with too many pet peeves are more likely to be ornery or sarcastic.